Software and techniques developed by DST have aided the Royal Australian Navy (RAN) and sparked interest from the Naval Research Laboratory (NRL) in the US, an organisation recognised as the pioneer of acoustic imaging. Acoustic imaging enables users to quantify a vessel’s acoustic signature and identify where the noise is being radiated. It does so by measuring noise in the nearfield (close to the vessel) and then projecting into the distance (farfield). DST’s developments enable accurate measurements to be taken without the need for a vessel to go to a range. This means extensive time and cost savings for the RAN. The NRL developed the original acoustic holography theory and processing but had concerns about transforming it from the laboratory to real life. In particular, they were uncertain how to obtain the precision they considered necessary. DST looked at the question of precision and how robust the methodology was and showed that it was indeed possible to make meaningful measurements on a submarine in the real world. 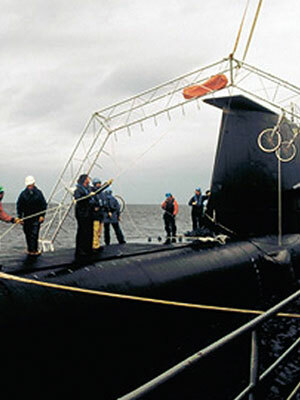 As part of this work, the NRL paid DST to provide a demonstration of the ‘real world’ system at the US Navy (USN) Southeast Alaska Acoustic Measurement Facility (SEAFAC) range in Alaska in 2000. DST first demonstrated the technology’s effectiveness in 1998, when tests were carried out on the submarine HMAS Farncomb. This boat had problems with machinery noise and though the source of the noise was known, the transmission path proved elusive. Using its acoustic imaging technology, DST was able to monitor the noise behaviour, identify the transmission path and then devise a suitable solution. DST has also used the system to investigate the noise generated by the fin top exhaust on submarines. Using a special test rig, the system was used to measure and provide a picture of the noise from the exhaust outlet all the way to the surface. The tests were undertaken in conjunction with Kockums in Sweden.